Butterfly kois, also known as Longfin Kois or Dragon Carps are characterized by their slender bodies and long flowing fins and barbels. They are usually white, yellow or orange in color and come in most of the traditional Nishikigoi patterns such as the Aka Bekko, Kohaku, Sanke, Shiro Bekko, and Showa to name a few. They were crossbred in the 1980's in an attempt to cultivate a hardier koi. Its specific koi lineage however, is debated. Some say butterly koi are a cross between the Indonesian Longfin river carp and traditional koi. Others, that the New York Company, the Blue Ridge Fish Hatchery developed these long-finned mutations under the auspices of Wyatt Lefever. He had apparently bought some grey/black carp variety from Indonesia by mistake but decided to see how the resulting fry would fair when bred with traditional Japanese koi. In seeing this new breed of long-finned and brightly colored fish Lefever's son, Randy is said to have remarked that they looked like butterflies- hence the name. 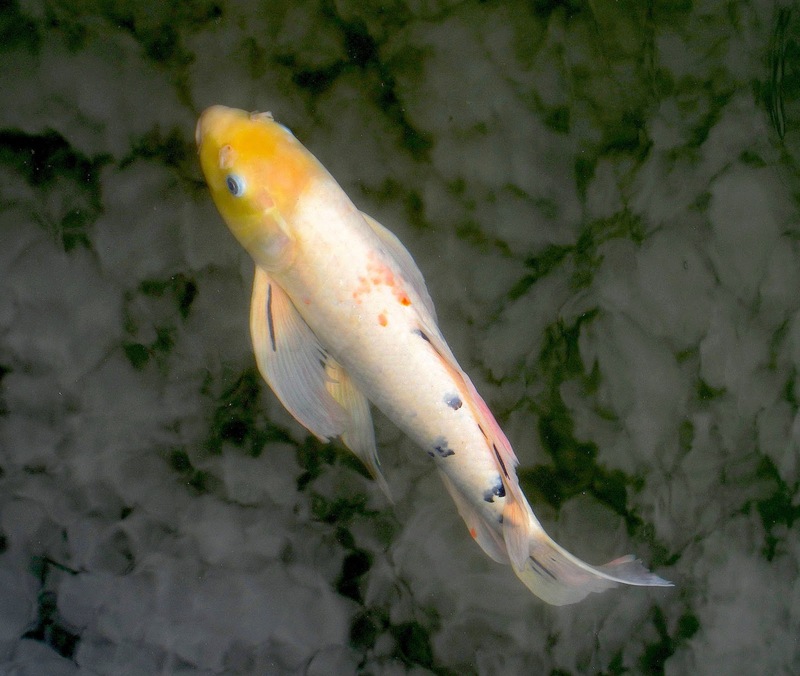 Previous to this particular breed, most traditional koi varieties interbreeding efforts with other carps of less ornamental advantage, such as the goldfish, led to sterile hybrids. Butterfly kois tend to come from Malaysia, Indonesia, Taiwan, Japan, China and Singapore. Outside of Asia, the UK and Israel are also known to breed them. Currently however, they do not hold their own show class in traditional Nishikigoi competitions due to their comparative degree of difference with other kois in appearance (finnage, dorsal, tail, shape and length) and cultivation. For instance, butterfly kois are known to grow faster than other kois, but never as large. Indeed butterfly koi growth is one of its most impressive features. The older the fish the longer the fins and barbel whiskers. Given adequate water, they can grow up to 40 inches. The gene for the long-finned feature of koi is said to be the dominant one since 80% of fry resulting from interbreeding between long-finned butterflies and Japanese koi result in long-finned fish. Despite their "outcasted" koi status, butterfly kois have nevertheless gained a following of their own due to the graceful effect of their "wings." It is thus commnon that traditional koi enthusiasts keep a specimen or two of these longfins in their pond. While there are reports that as of June 2006, The Association of American Koi Clubs (AKCA) introduced separate standards for judging butterfly kois or longfins in US competitions, these standards were not as refined as their traditional Japanese koi counterparts. However, in January 2009, AKCA published an article in its official magazine KOI USA detailing more specific criteria based on finnage appearance and length combined with anatomical information necessary to say a longfin was a more acceptable one than another. It also introduced a classification system of different sets of longfins, criteria for jugding small vs. larger longfins and recommendations for measuring longfins in general. Currently, if there is any agreement at all, it is to hold fast to the criteria that applies to all koi across the board. For instance, the lack of abnormalities and absence of disease or parasites is a definite must for all competing koi. Another is the necessity of brilliant colors. Most butterfly koi enthusiasts however, maintain that these separate longfin standards are still being determined at the local koi show level. Some judges like long flowing fins for butterflies and others like short ones. Market prices however, for butterflies, give the longer and more flowing fins, the higher the grade. Until the standards have been set, however, it is unlikely to have any certainty at all that a butterfly koi purchase is a premium grade one or not. Jason Williams is an expert on Koi Fish and their habitat.